Tips For Learning How To Sing While Playing Guitar • Play Guitar! The first step to learning how to sing with a guitar is finding the root of the chord you’re strumming. For many beginners, this can be a difficult task. We’re often so used to have another person’s voice from a recording to guide us when we’re looking for which notes to sing. When you take away that guidance, many musicians lose their sense of pitch. This is why it’s important to train yourself to find the root of a chord. If you strum a chord and have no idea which notes to sing, try experimenting with your voice. Some notes you sing will fit with the chord much better than others. This is because when we sing “non-chord tones,” we create dissonance. The notes that sound correct will probably be either the root, third, or fifth of the chord. To ensure you’re singing the correct pitch, find the root on the guitar and pluck the string. If you want to take a look at some of the best fingerstyle guitars, check out this article. After you’ve learned how to find the root of a chord with your voice, you can begin to practice harmonizing. Harmony is when we combine different notes together to create texture. If you simply sing the same note an octave higher or lower, you haven’t created any texture. As a singer, it’s important to stack thirds and fifths to create something more complex. The first step to singing thirds is to identify the root of the chord you’re playing. If your root is C, then a third above will be an E. Likewise if your root is G, a third above will be a B. Find these notes on your guitar to ensure you’re singing the right pitch. To take things even further, you can learn to sing fifths above. A fifth above C is a G, and a fifth above G is a D. If you’re singing with two other musicians, this will allow you to create full major and minor chords vocally. Taking advantage of your diaphragm is important for singers who want to create a powerful sound. Your diaphragm is a sheet of muscle that relaxes when you breathe in air, and contracts when you breathe out. When singing with your diaphragm, it’s important to breathe deeply “into your diaphragm.” Typically, most people breathe very shallowly. Try breathing in deeply and pushing out your stomach as much as you can. When you exhale, pull your stomach back towards you. This is how you should breathe when you’re singing. Doing so will give you much more presence. If you want to strengthen this muscle, try breathing into your diaphragm for as many counts as you can, holding your breath, and then breathing out slowly. 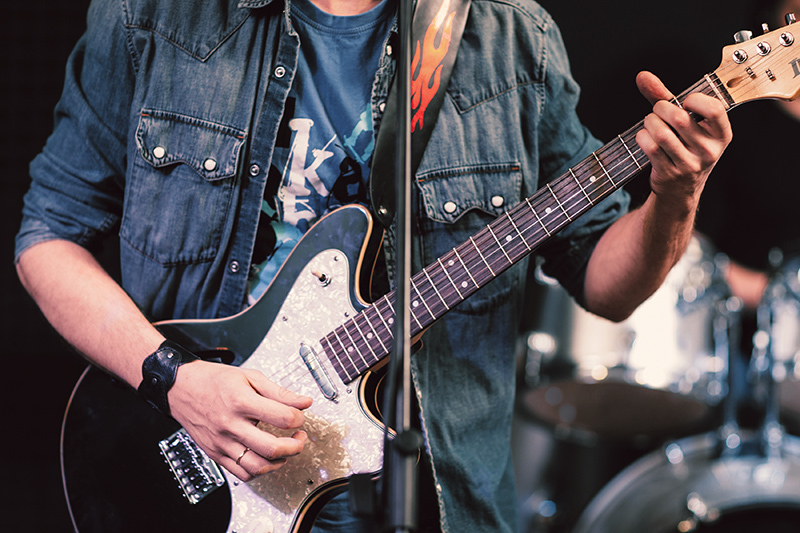 Since many guitarists sit while singing, their breathing can often be compromised. The more you strengthen your diaphragm, the less your vocal power will be compromised from hunching over your guitar. If you’re trying to sing a song and you just can’t seem to hit the right notes, it might be because the song isn’t in a key suitable for your vocal range. This problem is common for women singing songs by men and vice versa because men’s voices tend to be a lot lower than women’s. Capos allow musicians to change the key of the song they’re playing without having to mentally work out the new chords. On piano, changing a key requires shifting the chord progression up or down a certain number of steps. For example, if your chords are: C, F, and G, and you want to raise the key by one whole step, your new chords would be D, G, and A. While changing keys can be simple, more complex chords make things difficult. That’s where a capo comes into the picture. By putting your capo on the first fret and strumming the same chords to a song, as usual, you’ll have raised the key by one-half step. Therefore, if your chords were: C, F, and G, they will now sound like a C#, F#, and G#. If you’re not sure which key you should be singing in, simply experiment with the capo on different frets to find a range that’s comfortable for your voice. You might find that only one simple half step will solve most of your vocal range problems. I’m Natalie. I work as a professional musician, session guitarist, and guitar teacher, and would like to use my music blog as a personal outlet to share my six-string knowledge with the world.